The corn plant is an oldie but goodie in the houseplant industry. Europeans have been using them as indoor plants since the mid-1800s and they’ve been popular in the United States since the early 20th century. Corn plants are grown as thick canes that sprout from buds along the cane, achieving a “false palm” effect (which is why they’re sometimes called false palms). The leaves are long and narrow (like those of corn). They make good houseplants because they are tall and narrow, with controlled growth, and can withstand a fairly significant amount of abuse from casual indoor gardeners. Corn plants are usually grown as large potted plants, planted in loamy, well-drained potting soil. It does best in bright indoor locations with indirect lighting, where it is protected from direct sunlight and drafts. Maintaining good humidity levels is critical; this can be done by placing the pots on beds of wet pebbles and misting the plant leaves regularly to increase humidity. Keep the soil moist during the growing season, then reduce the watering in fall to late winter. Soils should never be allowed to dry out fully. 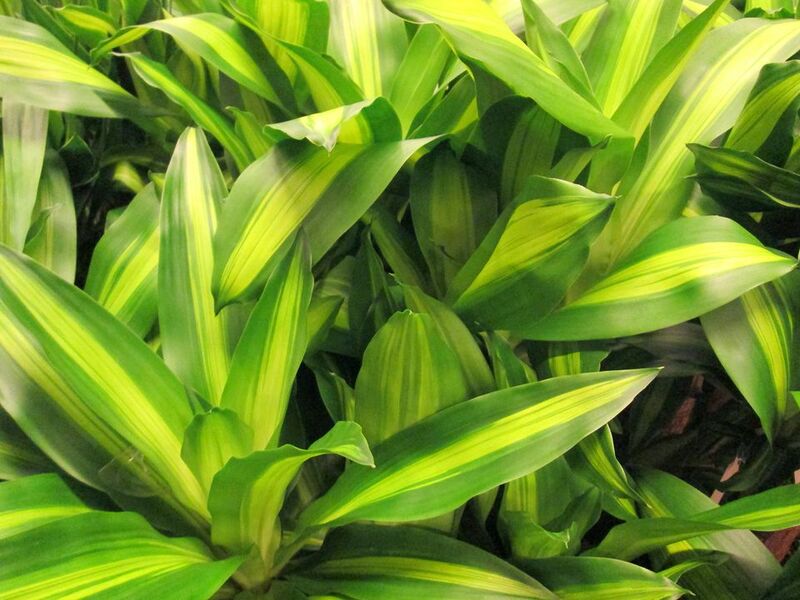 Like other dracaena species, these are sensitive to fluoride and boron, which can cause leaf tip burn. Watering with tap water can therefore sometimes cause leaf burn. Plant containers can be placed outside in summer in a sheltered, shady location, but they need to be brought back inside well before temperatures begin to fall below 50 degrees Fahrenheit. As is typical of houseplants, growing these plants is largely a matter of providing for their essential needs in a balanced manner. Try not to expose them to extreme conditions in any form, whether that means bright light, overly cold or warm temperatures, or strong winds. Try to locate this plant near a window with filtered sun. Too little light will result in leaves losing their stripes, and could cause the plant's growth to become stunted. Keep evenly moist, but if you have to err, do so on the dry side. Keeping it too dry, however, will result in brown leaf tips. The plants are sensitive to fluoride, which can kill the plant or stunt its growth; distilled water is best for watering these plants. Keep above 55 degrees Fahrenheit if possible. They do best in the mid-70s, and, they prefer at least 40 percent humidity, approaching the conditions of tropical Africa, the plant's native range. Loose, well-drained potting soil mix is the best option for growing this plant. The roots don't like to be soaked in water. With corn plants, fertilize lightly since the plants store nutrients in their canes. Use calcium supplements (chelated calcium or even gypsum) to prevent leaf-tip burn. Corn plants root readily from cuttings. Push tip cuttings into warm soil and keep moist. You can also root cane pieces directly by pushing into growing medium. Make sure the dirt is strong enough to support the cane upright. Rooting hormone can help increase rooting. Don't be discouraged if it takes some time for new cuttings to root; propagating corn plants is an inexact science and even experienced gardeners can have trouble with it sometimes. Repot annually into larger pots with fresh, free-draining potting soil. To repot this plant, remove the soil around it, lift the plant as a whole, and replace it in a larger container, making sure not to damage its roots in the process. Then backfill the area around it with potting soil, and try not to pack too tight to ensure that the plant maintains good drainage. The true Dracaena fragrans has solid green leaves, but most people prefer the D. fragrans ‘Massangeana,’ which features a central, broad lime-green stripe down the middle of the leaf. Another variety, D. fragrans ‘Lindenii,’ has a dark green stripe down the middle and yellowish leaves. A final variety, D. frangrans ‘Victoria,’ has white and cream stripes, but is rarely seen in garden centers. If the plant grows too tall, you can cut the canes, and new leaf buds will break out near the cut. In addition to brown leaf tips caused by watering with fluoridated water, leaf discoloration can be caused by temperature fluctuations, water stress, and calcium deficiency. If your plant is healthy, the biggest problem is likely to be dust on its leaves. Clean the leaves with a damp cloth every so often to keep it looking its best. Watch out for spider mites, thrips, and scale, which can be a problem with most house plants.